. . . that's Dynamint. Breath takingly fresh. Deeply Penetrating, with a Cool-Warm sensation. Perfect for Deep tissue, Remedial sports massage, or just when you need soothing and relaxing warmth . . .
. . . to ease you into the most soothing sleep. There's never been a massage balm like Dynamint. Dynamint is regarded by many leading sportsmen to be the deepest and fastest balm. This is because Dynamint is specially formulated, on a state of the art substrate, to provide rapid penetration of the epidermis via the process of osmosis. It's special formulation gives Dynamint its unique penetrative performance and allows it to get to work almost instantaneously and provide longer effect. Dynamint is a blend of Calendula aka Marigold (Calendula officinalis) and three natural essential oils, blended as a true oil in water emulsion. Increases circulation and generates heat . Applying Oil of peppermint on your skin, your largest sensory organ, is very invigorating. Rubefactant and skin conditioner, natural astringent. Mood and skin invigorator and penetrant. . Skin conditioner, soothing and disinfecting. Capable of penetrating into the lower skin areas. Dynamint is not greasy and does not leave behind any sticky or unpleasant residues. Dynamint has a refreshing smell that in our own survey spouses and family found more pleasant and relaxing than any of the competition. Dynamint muscle rub is enjoying tremendous acceptance amongst the professional sporting community and is especially useful where there has been over exertion due to competitive sports activity. How do I use Dynamint ? Gently massage a generous amount to effected area, or use as a light application balm, simply applying Dynamint to the skin and allowing balm to soak into tissue. Use anywhere you feel sore. A gentle application of Dynamint around the temple area is very invigorating. Dynamint should not be used during pregnancy. External use only. Not to be applied to broken skin. High 5 Donut running bottle that grips to your hand and can hold 330ml of fluid. 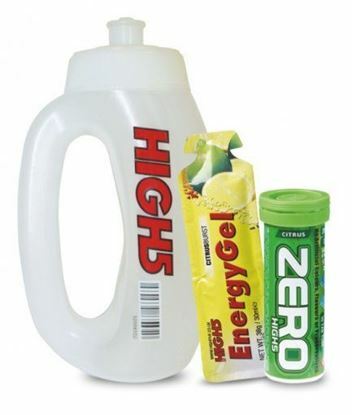 Comes with a free High 5 Energy Gel and a free High 5 mini ZERO tubes containing 10 tablets.